Since moving to California a few weeks ago, I’ve been trying to get myself in the Spring mood. Although it’s easy to appreciate the sunshine and warm temps, my mind is still stuck in the chilly early Spring temps that I’ve become accustomed to my entire life back East. I’ve been confused with my wardrobe here, and as I get ready each morning I automatically gravitate towards sweaters and jeans, but then come to my senses and realize these will be way too warm once we hit noon. In order to get out of my rut, I decided to do some shopping to get myself into the Springtime mind set. With my mom coming out to visit me for Mother’s Day, I wanted to pick out a dress that reflects my mom’s favorite pattern of all time…florals! While these prints can sometimes be busy and hard to style, I wanted to give you a few tips to make styling flowery tops, skirts & dresses a breeze this season. 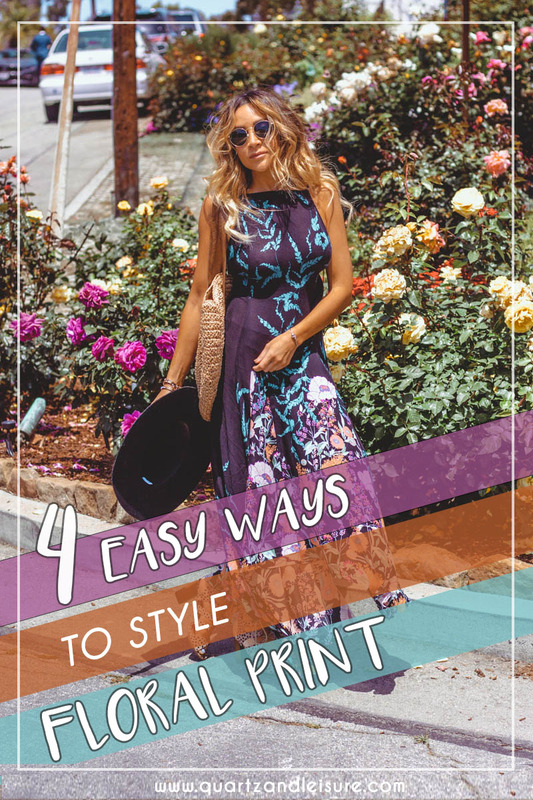 Keep reading for my easy tips on how to wear floral print. 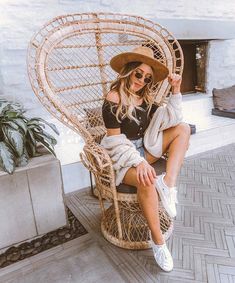 Undoubtedly one of the hottest trends last Spring/Summer was the straw bag trend, and I see it only becoming even more popular this year. A straw bag is a great way to accessorize any floral print and it really gives that “I just stepped out of the French countryside” carefree feel. I am wearing a straw bag with my dress, but feel free to wear a straw hat, basket bag, or even some straw inspired espadrilles. 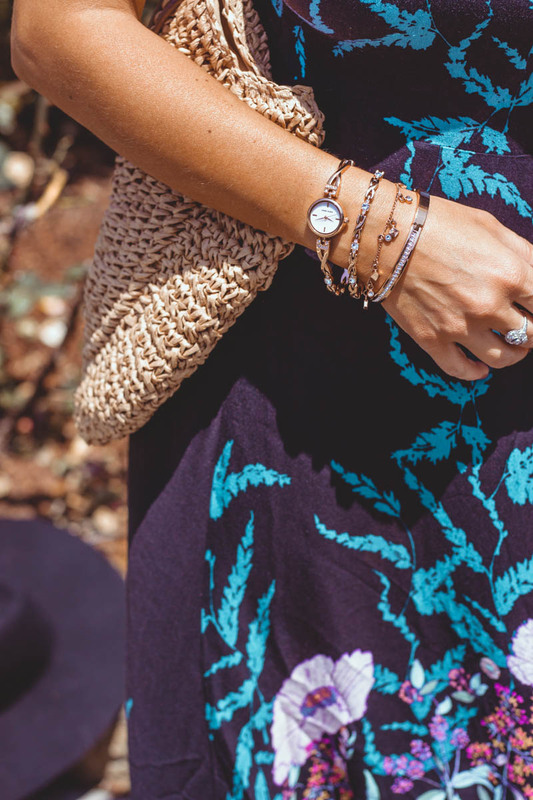 One of the best ways to style florals this Spring is with dainty jewelry & accessories. Wearing delicate jewelry ensures you don’t add “too much” to the already busy print. On my recent trip to get the floral dress, I also stopped by the watch counter at Macy’s and picked up this adorable watch set from Anne Klein. It features the watch, plus 3 additional bracelets, that layer together perfectly. (My favorite is the one with the tiny geometric charms!) 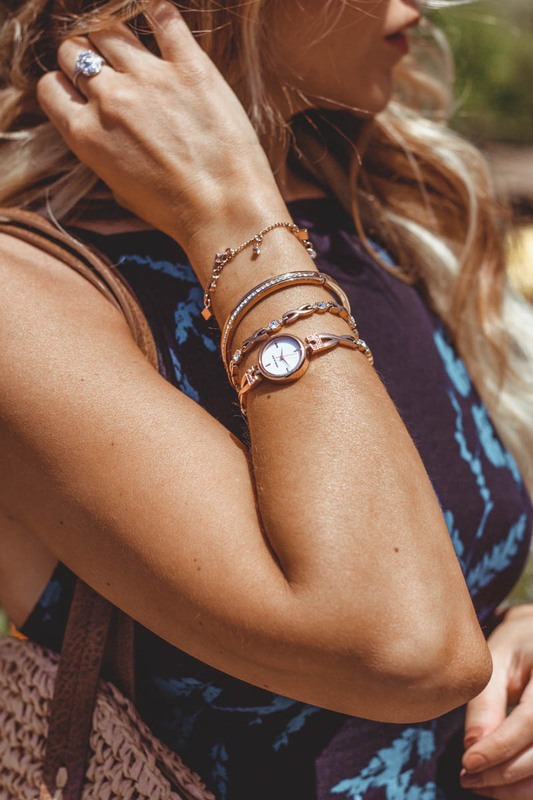 I also love the rose gold finish — it’s such a soft color that can be paired equally well with both cool toned and warm toned floral prints. Wearing floral doesn’t mean you need to go head to toe flower garden, like that Easter dress your mom made you wear in the 7th grade. (Sorry, Mom, that dress for sure would have been on Joan Rivers’ Worst Dressed List of Middle school). Try pairing your floral print skirt with a polka dot top or some bold black and white stripes. I paired my dress with a leopard shoe to add an extra pop of style. 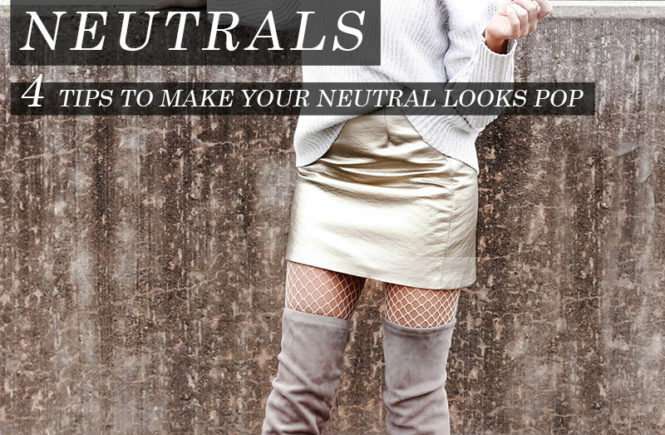 Don’t be afraid to mix and match patterns to add a modern element to your look. Don’t get me wrong, I love a large floral print if it’s done the right way. But usually large florals are overwhelming to the figure and can add the look of extra weight if you’re not careful. 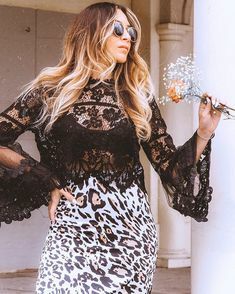 Try to stick with a smaller floral print, or if you still love large flowers, try some that are only in one area of the clothing (and not around the waist or hips). For example, on my dress the florals are located mostly on the lower hem of the dress so it doesn’t create the illusion of extra bulk in the middle. So, I hope you found my tips on how to style floral print helpful for your wardrobe this Spring. And if you’re still searching for the perfect gift for Mother’s Day, hopefully this post has given you some ideas! 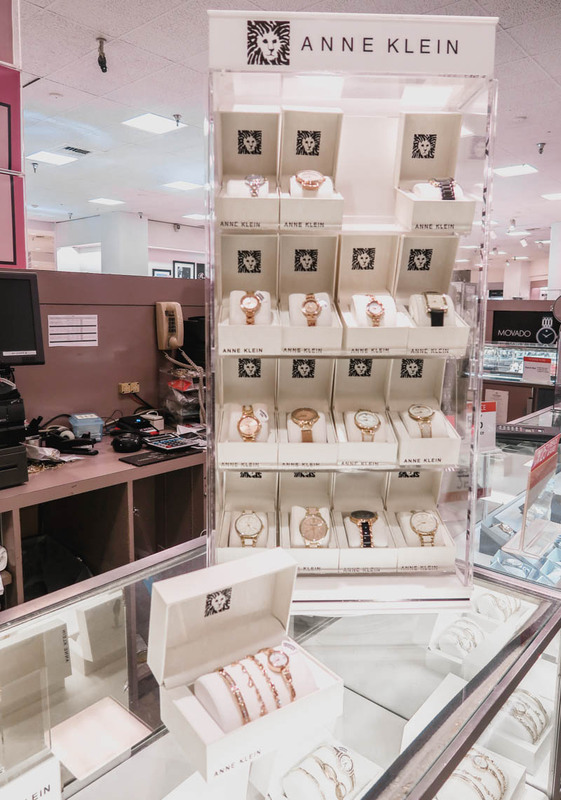 If you want to check out the entire line of Anne Klein watches at Macy’s, click here for the entire collection. 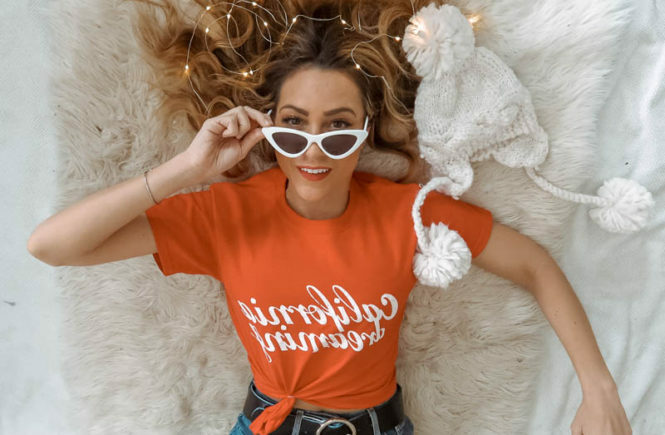 I want to thank you again for following along with me, if you want to catch up on what’s happening in real time, check out my social channels — @quartzandleisure on Instagram!